It's almost impossible to find a business that doesn't offer some type of kiosk. Whether it's your standard ATM in a convenience store, a photo kiosk in a pharmacy, or an informational interactive kiosk in a mall, the concept of a sturdy and reliable self-service machine to handle basic tasks and transactions has really taken off. In some cases, interactive kiosks can act in place of an extra employee—without the interview process or performance review. Using standard touch screen technology, people can navigate through a simple screen of menu options to get the information they are looking for without human assistance. They don't take up much floor space and you can even customize the look and feel of the enclosure to appropriately represent your business. With the help of a kiosk vendor, you could determine what you would like your interactive kiosks to do. If you will provide products or services, such as a photo printing kiosk or bill payment machine, the kiosk can be equipped with a bill acceptor or credit card swipe. If it's just information you're looking to share, a vendor can help you design the right presentation and interface. One concern businesses have about interactive kiosks is: who maintains them? A kiosk vendor can set you up with a monitoring company that will keep track of each kiosk's performance. Should the machine break down or need adjustments, such as refilling paper or removing cash, they are notified immediately and a rep is sent to the site to maintain the device. 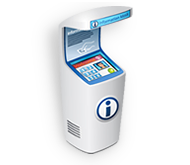 What is the intended use or application for your interactive kiosk (ticketing, retail marketing, Internet access, educational use, point of sale transactions, etc)? Will you need a machine that integrates with other systems or just a stand-alone kiosk? What other features or products do you need with your interactive kiosks (printer, touch screen, keyboard, bill acceptor, etc)? Are you seeking an informational or transactional kiosk? What is your preferred installation timeframe for your new kiosk(s)?